Delivering the chic fragrance of a luxury boutique hotel, our Fig Diffuser creates a unique atmosphere within your home thanks to its natural, earthy bouquet and delicate, sweeping top notes. The scent of fig has become the benchmark in luxury fragrance, with many of the world’s finest perfumeries seeking to perfect this timeless, powerful, and utterly compelling aroma. At Parks, we believe we’ve achieved this in our luxury Fig Diffuser. Created using authentic fig scents, our diffuser blend offers a sophisticated and evocative fragrance, transmitted throughout your home via a handful of natural and responsibly-sourced rattan sticks. 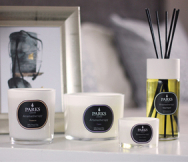 The fragrance is complex, bold, and rich, with a top note of fruit which helps to add a bright and invigorating element to the aroma – perfect for creating a luxurious and comfortable ambience within your home. Exotic and alluring, our love of figs goes back thousands of years, with trees bearing these succulent fruits supposedly found within the Garden of Eden. The scent is natural and stirring, reminiscent of bracing country walks and the sultry smell of a Middle Eastern bazaar. In the home, the aroma is velvety, luxurious, and intriguing, and ideal for creating interesting scent zones from room to room. Part of our popular Home Fragrances collection, the Fig Diffuser contains 200ml of delightful scents, offering up to 12 weeks of fragrance. The diffuser is packaged in a charming box and complete with natural rattan sticks, making it the ideal gift or finishing touch for your home.